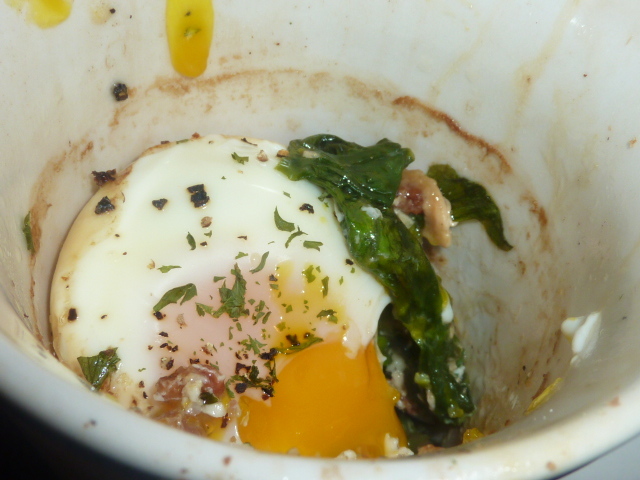 Baked eggs are one of my favorite breakfasts. In the past, I’ve posted recipes for eggs en cocotte with pancetta and romaine, baked eggs with spicy butter beans and potatoes, and tomato and spinach baked eggs, but I make them quite frequently. 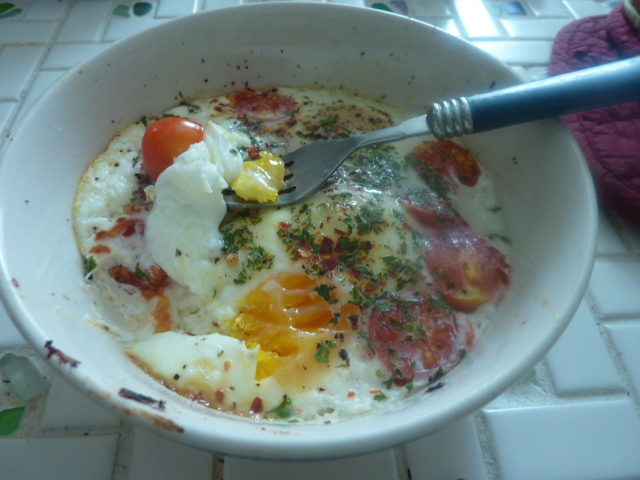 This take on baked eggs was particularly successful – the bite of the goat cheese and slightly sweet, slightly acidic flavors of the cherry tomatoes worked beautifully with the creamy eggs. 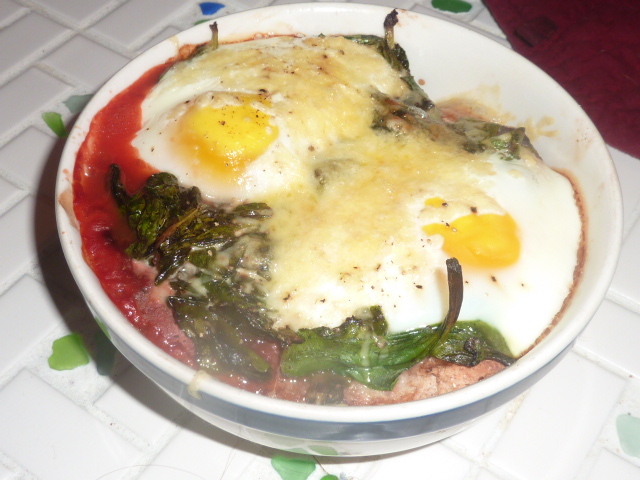 Baked eggs are great for both their versatility and their hands-off ease. Simply put all the ingredients in a bowl, throw them in the oven, and set a kitchen timer. Then, you get to enjoy a breakfast that is so delicious that it feels decadent but is quite healthy and balanced. Spray an oven-safe bowl with non-stick cooking spray. Add crumbled goat cheese to the bottom of the bowl. Place tomatoes on top of the goat cheese. Carefully crack the eggs into the bowl. Pour milk over the eggs. Season with crushed red pepper flakes, dried parsley, kosher salt and freshly cracked black pepper. Place bowl in the oven and bake 15-18 minutes until desired consistency. I baked these about 16-17 minutes and the yolks were just set. Serve with a few slices of toast for dipping (I used whole wheat and it was divine). This dish was incredibly flavorful and incredibly healthy. It had the perfect combination of acid from the tomato and balsamic, creaminess from the avocado and eggs, and bite from the spinach. It was also quite filling, thanks to the bread and the protein from the eggs. I love to bake eggs because they always have the creamiest, fluffiest whites. Heat olive oil in a medium non-stick pan. Add spinach and season with crushed red pepper flakes, kosher salt, and freshly cracked black pepper. Sauté 5-6 minutes until wilted. Place toast in bottom of a bowl. Top with smashed avocado. Add crushed tomatoes and spinach. Use a spoon to create depressions in the spinach. Carefully crack eggs into depressions. Season with kosher salt and freshly cracked black pepper. Top with shredded cheese. Bake 18-20 minutes until egg whites are set and yolks are cooked to desired consistency.